Christmas has always been a time for indulgence. We look back at what people gave in the 1950s, 1960s and 1970s, and why. Children got the latest toys. In the 1950s they re-enforced gender roles: boys got Dinky cars and Meccano sets; girls received dolls and toy prams. Read more about Christmas toys from the past. There was always something under the tree for mum and dad as well. Christmas gifts reveal much about society and how men and women saw themselves. The gifts also reflected traditional roles. Men's presents were either about festive indulgence or practicality. Whereas women's presents were about glamour, but also their role as the homemaker. 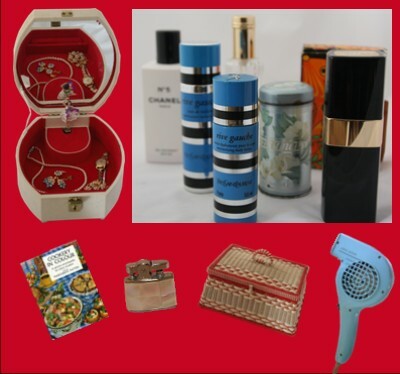 Presents for women from the 50s, 60s and 70s: jewellery box, 1960s; a selection of perfumes from the 1970s; Marguerite Patten's 'Cookery in Colour'; mother of pearl cigarette lighter; sewing box, Morphy Richards hair dryer 1960s. Gifts for women were more extravagant than those for men. This reflected the status of the man as the breadwinner. He had more money to indulge his wife. The most expensive items in the Harrods Christmas catalogue for 1958 was a "youthful mink bolero" for a "great party goer" at £59 [or £900 in today's money]. There was also a solid gold wristwatch by luxury Swiss watchmaker, Cyma, at £57 10s and cocktail dresses costing 23 to 33 guineas. (See our article on pounds, shillings and pence for more about pre-decimal currency). Husbands also searched out glamorous jewellery to impress their wives on Christmas Day. Jewellery boxes were a favourite stocking filler. Perfume was another staple. Channel No 5 is a timeless classic as desirable in the 60s as it is today. A few other classics fragrances were: Estée Lauder Youth Dew (1953), Aqua Manda (1970), Yves Saint Laurent Rive Gauche (1970) and Anais Anais (1978). Smoking was increasingly popular with women in the 50s, 60s and 70s. It still had an image of glamour and femininity, as well as a new sense of freedom. A small gift such as a mother of pearl lighter by Field might have made a stocking filler. Like a lipstick or powder compact, it fitted neatly into an evening bag. 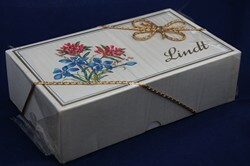 1 lb Lindt Mountain Rose chocolate box, 1966. For indulgence women looked forward to a box of chocolates, perhaps Milk Tray or Black Magic. For real luxury people bought Swiss chocolates. Lindt Mountain Rose (right) was popular. Women took responsibility for everything in the kitchen. A favourite gift from him to her was Marguerite Patten's 'Cookery in Colour' book. At the expensive end of the scale, many 60s' wives would have loved to find a Kenwood Chef under the Christmas tree. If women wanted to get their man into the kitchen, they might have bought the Esquire Cook Book (1956) or Len Deighton's French Cook Book (1965). These books did little to persuade husbands to follow fictional spy and amateur gourmet, Harry Palmer, into the kitchen. Gifts for men were often about indulgence in the form of whisky or cigars. A box or tin of cigars (below Wills' Castella, Henri Wintermans and Embassy) were a popular gift. A favourite tipple was always a good stocking filler. In the 50s and 60s, Haig Whisky was Britain's best-selling brand. The Christmas treat was Haig's 'Dimple' in its specially shaped bottle. The design of which dated from 1893. Small personal accessories such as cigarette lighters, cufflinks or items of clothing such as shirts, socks or ties were also given. A well off man from the 1950s might have got a silk dressing gown or a silk cravat. Harrods chin-chin choker with a Christmas drinks design at 30 shillings might have been ideal. Gifts for men reinforced the model of the man as the provider, and particularly the business man. 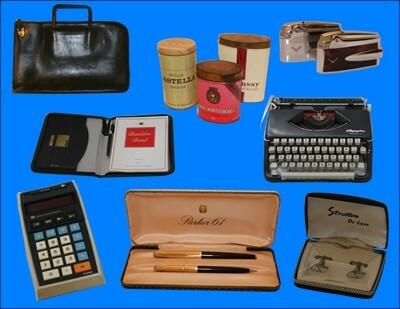 The 50s and 60s office worker could look forward to leather brief cases or document carriers, pens, desk sets, slide rules and portable typewriters. In the 70s the list included pocket calculators too. If the man was more practically minded, he might have unwrapped an electric drill or a set of new spanners for the car. If you had plenty of money to indulge your friends and relatives you might have bought them a Christmas hamper. These two examples from Harrods 1958 catalogue show contemporary middle class tastes. Figs and dates were always popular Christmas extras. Glace fruits were also a favourite gift. Meltis was a popular brand. Sherry and port were favourite Christmas gifts in the 50s and 60s. Sherry continued to be popular into the 70s. Harvey's Bristol Cream was the most well known brand. Gin was as popular in the 50s as today. Although the brand names have changed, in the 1950s you would have probably bought Booth's (33/4 per bottle in 1950), Gilbey's, Beefeater or Gordon's. 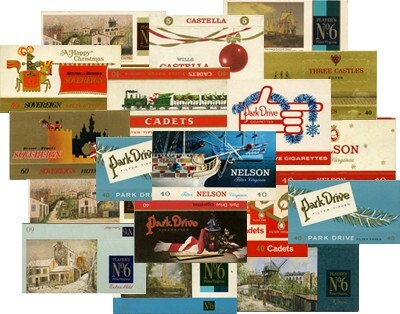 A selection of Christmas cigarette packet sleeves from the 1960s and 1970s. In spite of an increasing body of evidence blaming smoking for cancer and other diseases, cigarettes were high on the Christmas shopping list for both men and women in the 60s and 70s. Manufacturers packaged forty or fifty cigarettes in sleeve holding a couple of regular packs. There were new designs each year and you could write "to and from" on the back, so at least you knew who was shortening your life! Smokers at Christmas often took the opportunity for a longer, more luxurious smoke. They looked forward to king size versions of their favourite brands, such as Player's No6 Kings.